Send an elegant tower of Mrs. Fields® treats to celebrate. Cookies, brownies, and candy. How could you go wrong? Traditional Bundle includes the following: 48 Nibblers® bite-size cookies, 12 full size brownies, and 2.5-oz of delicious salt water taffy. 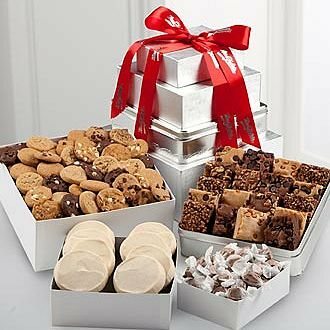 Deluxe Bundle of Treats: 120 Nibblers® bite-size cookies, 18 full size brownies, 8 frosted cookies and 5-oz of delicious salt water taffy. Premium Bundle of Treats: 168 Nibblers® bite-size cookies, 28 full size brownies, 10 frosted cookies, 12-oz toffee nut popcorn clusters and 5-oz of delicious salt water taffy.